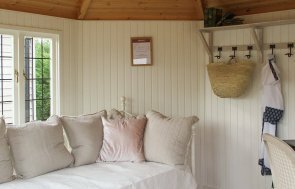 Measuring 3.0 x 4.2m, the Summerhouse has an apex roof covered with grey slate composite tiles and black guttering added to the fascia boards. The exterior is clad with smooth shiplap timber and painted in the opaque exterior shade of Farrow & Ball Green Smoke, which was selected by the customer from our extensive palette of exterior shades. 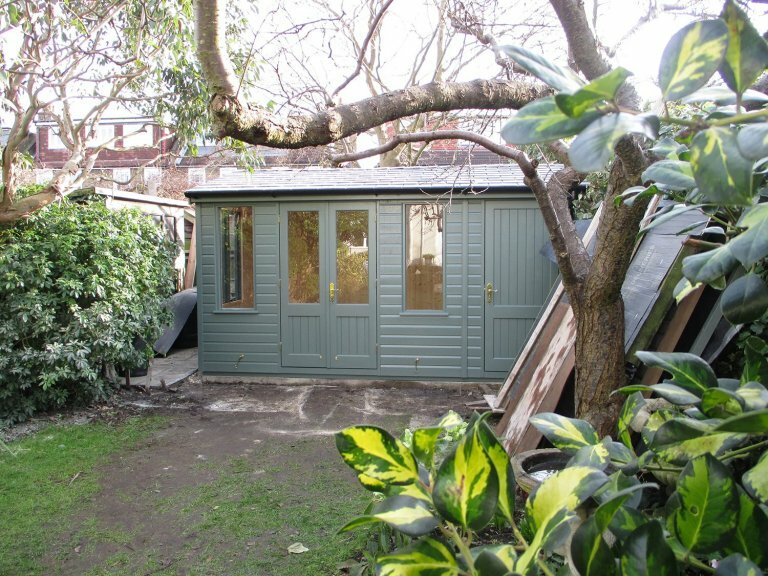 The building has a custom partitioned area added on to the length of the shed, which is accessed by an external door and offers a separate space to provide storage and to eliminate the need for both a shed and a recreational building. 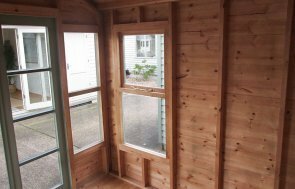 Internally, the summerhouse area of the building is insulated and lined as standard in both the walls and ceiling with floor insulation added and natural pine lining. The customer also opted to add our electrical pack into this area of the building, which consists of four internal duo sockets, interior lighting with a gang light switch and an exterior waterproof dual socket. In order to get a better understanding of the high-quality and craftsmanship that goes into making our buildings, we warmly invite you to one of our UK show centres where there is up to 25 different display buildings and a team of friendly advisors on hand to assist you with any queries you might have. Locate your nearest here, or instead get in touch with us on 01760 444229 to plan your visit.